Laundry, right? As a mom, this seems to be a never-ending chore, and the bane of my existence. I swear, my kids must change 3-4 times a day with the amount of laundry I have to do every day. Can anyone else relate? When I was pregnant and dealing with a newborn, I suddenly learned just how big of a decision laundry detergent could be. I’d always just used whatever was cheapest! Over the years, though, I’ve really learned to clean up my laundry routine. We’ve finally got it to a point where I feel good about sharing, so here it is! Before I tell you about the products we use, I feel like it’s important to explain why we no longer use conventional laundry products anymore. 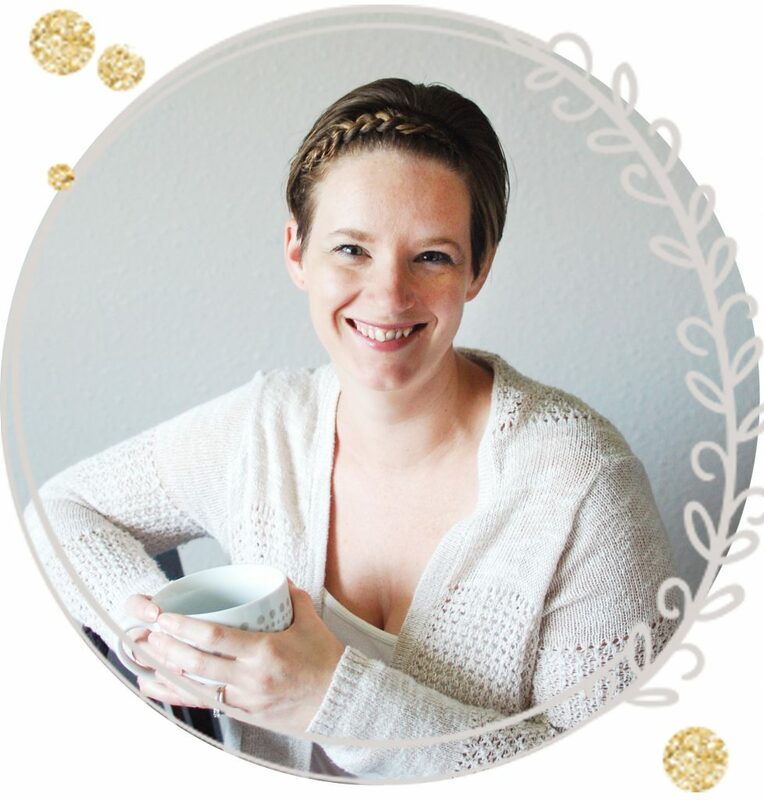 I’ve talked before about our mission to detoxify our home, and our experiences on our wellness journey, so if you can go more in depth in those posts, but today, I’ll talk specifically about laundry. At least, the 2 main products we eliminated from our home: dryer sheets, and conventional detergent. Conventional laundry detergent is loaded with icky ingredients that are terrible for us. I know so many people don’t consider it a problem, since it’s just laundry detergent, but it really is. Laundry detergent is loaded with toxins that infiltrate our clothes and then sit on our skin all day. And, since our skin is the largest organ on our body, that matters. Whatever you put on your body, you put in your body as it absorbs. It’s just as important to check the ingredients in your cleaners as it is to check the ingredients in your food. Optical Brighteners: This is really common in most detergents because it gives the appearance of being clean and white. They are chemicals designed to be absorbed into your clothes that reflect blue light and make clothes appear whiter than they are. I don’t want my clothes to just look clean. I want them to actually BE clean. Sodium Lauryl Sulfate (SLS): This is a cleaning agent widely used in products like soap, shampoo, toothpaste, and laundry detergent. It’s used because it’s inexpensive and produces a foamy lather. Unfortunately, it can also cause irritation and itching. Synthetic Perfumes: Synthetic perfumes and fragrances are a big no no in my house. Due to an act passed by congress, companies don’t have to disclose what their ingredients are. Instead, those ingredients are listed under the blanket label of “fragrance.” Many of these chemicals are known carcinogens, neurotoxins, and can be known to cause respiratory problems and headaches. I know I personally know so many people that battle with regular headaches and sensitive skin. These ingredients could very likely be a big part of the problem, and it’s such an easy fix! We tossed dryer sheets years ago. It’s actually one of the first things we ditched in our journey to a more toxin-free lifestyle. If you’re still using dryer sheets, please read the following, and consider making a switch. Like detergents, dryer sheets are loaded with toxins that end up on our skin. According to neurologists and other experts in this arena, these toxins in particular contribute to dysfunction and disease of the nervous system. Alpha-Terpineol: can cause central nervous system disorders, loss of muscular coordination, central nervous system depression, and headache. Benzyl Alcohol: causes central nervous system disorders, headaches, nausea, vomiting, dizziness, central nervous system depression, and, in severe cases, death. Camphor: on the US EPA’s Hazardous Waste list. Central nervous system stimulant, causes dizziness, confusion, nausea, twitching muscles, and convulsions. Chloroform: on the EPA’s Hazardous Waste list. Neurotoxic and carcinogenic. Ethyl Acetate: on the EPA’s Hazardous Waste list. Narcotic. May cause headaches and narcosis (stupor). Linalool: causes central nervous system disorders and is labeled as a narcotic. Pentane: causes headaches, nausea, vomiting, dizziness, drowsiness, and loss of consciousness. Repeated inhalation of vapours causes central nervous system depression. In addition, most dryer sheets also contain “fragrance” which is really just a blanket statement that covers a whole host of other harmful ingredients. Just like other perfumes, a person’s sensitivity to these perfumes decreases over time to the point where they don’t even notice how potent these artificial fragrance chemicals are. None of this would be interesting if it weren’t for the fact that these fragrance chemicals are known carcinogens. They cause liver damage and cancer in mammals. Did I just overwhelm you with scary facts and chemical names? Don’t worry. I felt that way when I first started out, too. Memorizing each chemical and it’s dangers is less important than knowing what to use instead. So, let’s talk about what we do like to use! About 7 months ago, I was introduced to wool dryer balls. I bought a pack off of amazon to try out, and can I just tell you, they are amazing? I don’t even know why anyone would spend so much money on dryer sheets if they knew how awesome these were. 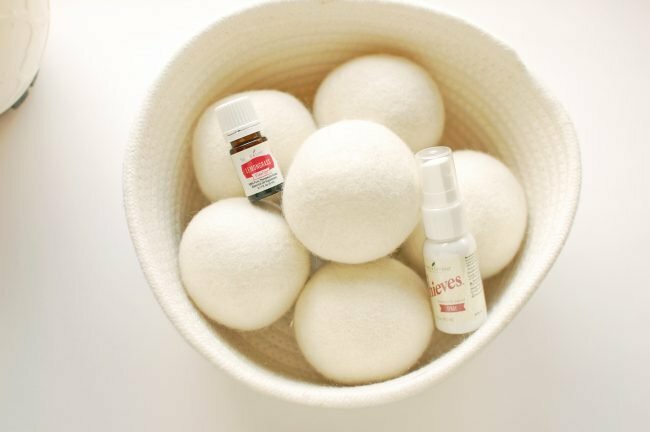 Wool dryer balls contain zero toxins, only need to be purchased once, can smell like whatever you want them to, reduce static, and they cut down on drying time. I’ve used these plain, but I also like adding essential oils, since they make my clothes come out of the dryer smelling good. I tend to use lemongrass or purification a lot, but really you can use any oil you want! I stopped using fabric softener years ago, and heard that adding a little vinegar to the wash can really help cut down on static and help clothes smell fresher. I’ve been doing this for a few years and I really do love it. I don’t miss fabric softener at all, and never have a problem with static. This is the newest addition to my laundry routine, and was the final piece of the puzzle. 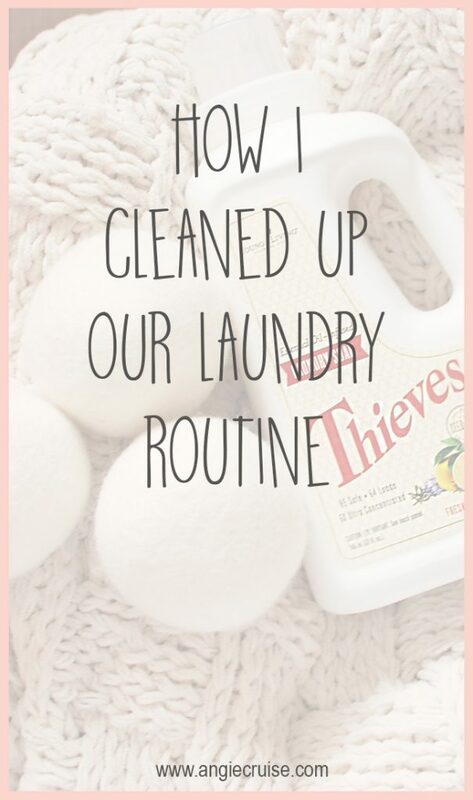 We’ve struggled for years trying to choose a laundry detergent that didn’t irritate our skin but also got our clothes really clean with minimal work from me. I did try making my own, and lasted about a year. I liked it okay, but it was a lot of work and I found myself dreading it. Finally, one day I got lazy and bought a bottle of free and clear detergent, washed my clothes, and then realized how dingy they’d gotten with my homemade recipe. We hadn’t noticed while we were using it, but one wash with conventional detergent showed me they weren’t really getting clean. Still, I didn’t want to use free & clear either, because it still has ingredients I don’t like. 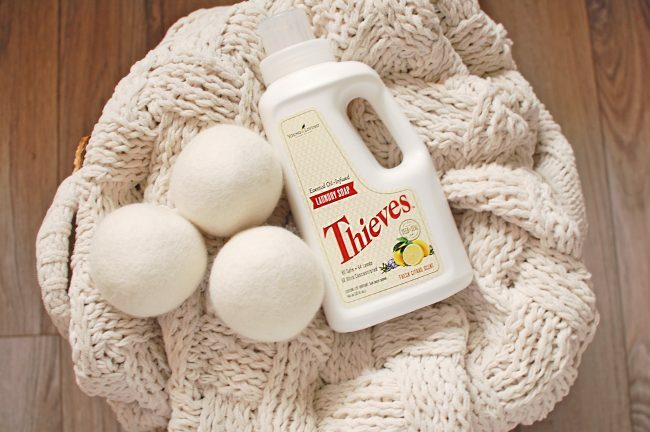 Finally, I took a chance on the Thieves Laundry Detergent last month, and I’m in love. When Young Living formulated Thieves Laundry Soap, they not only questioned what they should include, but also what they should leave out. That last question is always the most important to me. The more toxins a company says NO to, the more I like them. This product, like other products in the Thieves line, is a plant-based formula free from harsh additives and provides a true clean. 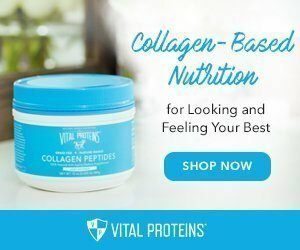 If you’re still using conventional product on your clothes, I hope you’ll try a few of these products! Start with the dryer sheets if you want to start small. They’re inexpensive, and such an easy thing to swap! 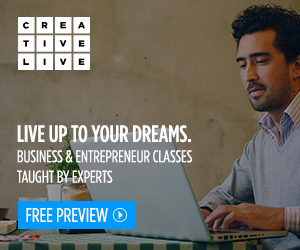 I’d love to help you learn more when you’re ready!